This is actually a wearable muslin for an important project. I have a goal and would love to achieve it. and I've been always afraid of its decay as I am so in love with it. That said, one month ago I suddenly realized that I would need to gain the ability to clone the sweater instead of being afraid of living without it. I am not able to knit this high gauge thing, but the idea is that I may be able to sew it, yes, sew it, why didn't I think of it? If it is possible to produce clones, it can give me an ever lasting secure feeling that I am practically never losing THE white sweater, yahoo! I checked and found some patterns for raglan sleeved pullovers and decided to give a try with Sloppy Josephine Tee pattern from Papercut patterns. They provide free shipping, worldwide, so I didn't hesitate too much about ordering the paper pattern, although it was a bit more pricy than I usually spend on other simple patterns. According to the size chart, I am between sizeXS and sizeS, and I chose sizeXS for my first experiment. I narrowed neckline a bit by applying a slightly shorter neckband, shortened the length at the bottom hem, added a bottom hem band, and altered the neckline to V shape as my final plan calls for V-neck. I didn't apply any change in terms of sizing, because I wanted to see how it would originally fit on me. Overall and in the end, I think it fits on me very well in the chosen size. The only thing I noticed was that the sleeves were designed narrower than I had imagined. I think it would be better to consider to choose one larger size for sleeves when the fabric doesn't stretch very well, at least for me (as I tend to choose smaller size when I have no clue.) They aren't very very narrow, but I think I'd better mention it here because this may be quite true for many of you too. We can narrow down the width of sleeves most of the time but we can't widen the pieces of fabric parts very easily, I hope you know what I mean. I'm happy with my result and I think the pattern is pretty promising! I especially love the neckline, which looks quite similar to what I want. I'm going to add more alterations to it and hopefully get the clones in near future :) Now I have to get some quality jersey/knit for making imitation of knitted garments. Meanwhile, I enjoy this comfy top as it is pretty wearable and very cute! neckline altered to V-neck and also narrowed a bit, length shortened, and applied a folded hem band. Fabric: linen jersey, barely stretchy, thin, shiny, slightly sheer, and rose pink. I made a denim skirt for a newly purchased sweatshirt. When I was much younger, I had one rule. It was that I'd buy one new garment which can be a key item for the next season very very ahead of the time. It was usually a tee in the middle of shivering winter. And it was mostly a wintry sweatshirt under the summer sun. When this habit started, I was really young but couldn't afford expensive clothes except something casual like T-shirts and cotton sweatshirts. Though I had to wait for months before I could actually put them on, I really loved my silly tradition and I remember I always looked forward to the next season for the sake of the single item I already bought, every year and all year round. Sewing-wise, I sewed a mermaid skirt for the top. I thought its big silhouette would go pretty interesting with the skirt's flare in the hem. Because I rather like heavy puckering and wearing in cotton denim garments, I sewed a raw denim and washed it in hot water to shrink/crease it after sewing. 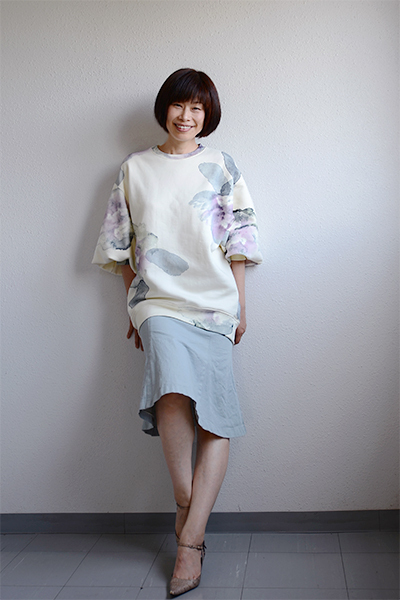 If you are interested in the shape of this skirt before washing/crushing, you can see it here in my other blog with Carolyn, photo maisonette, too. size40, down graded to 38. no lining. washed after sewing. lengthened by 7cm to achieve under-knee length, flare-ness increased quite much too. Just a quick update and a small proposition that I'd like to make to those who might be interested. I love linen clothes. Especially in summer. Linen provides simple style and feels comfortable in the weather. 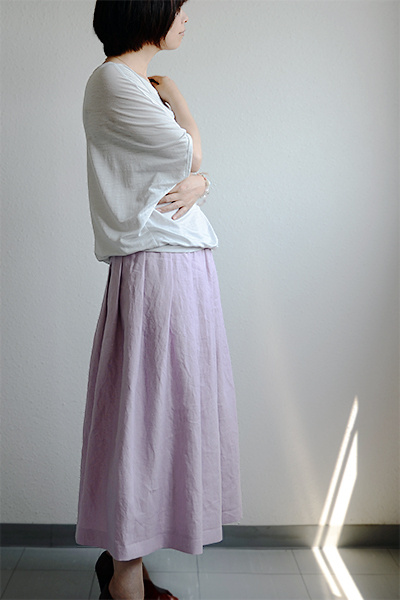 I made a linen skirt that was basically made from two tacked rectangular pieces of pink linen. 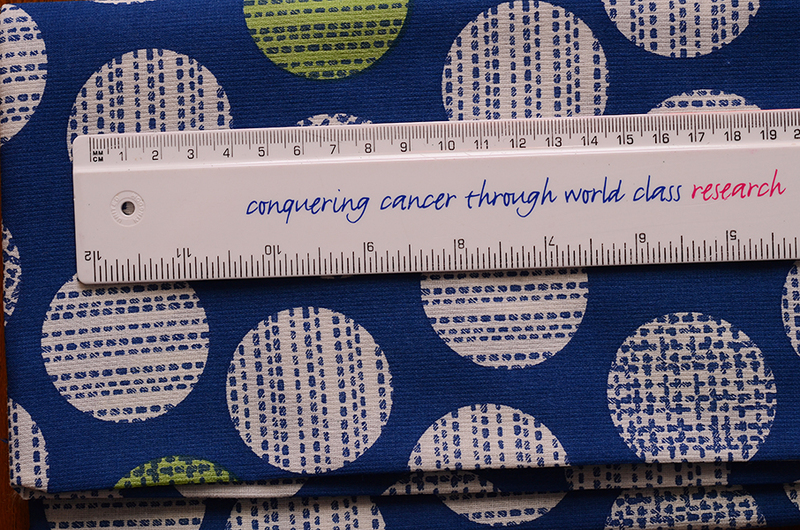 An elastic waistband, single pattern for both back and front. No pockets. Could be one of the simplest skirts in the world. Do I like it? Yeah! Isn't it cute and very summery in a good way? Actually this pink skirt fits for my summer outfit very well. I'm officially much lazier and choosing easy clothing even more in this hot season, as I am not good at living in the heat. Naturally my sewing gets easier and easier, simpler and simpler, year by year at this time of the year. 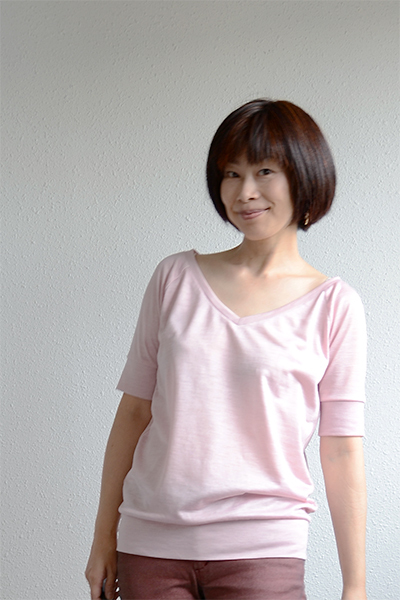 Yay for pull-on linen clothes that can be thrown into the washing machine two seconds after coming home (the homemade batwing top that I'm wearing in the pictures is linen too). I predict that I'd be wearing a piece of flat linen with three holes and overlocked hems in summer 2014. (and then an untreated linen sheet in summer 2015...) It's a prelude to sewing degeneration. By the way. I'm kidding. I tell you this in case you don't know me who can make silly jokes that touch no one's heart. I LOVE SEWING AND FASHION AND THEY MELT MY HEART ALL THE TIME. It is just that my clothing style happens to be simpler than it really should be and I feel no need to add extra value to my production even to the simplest garments. Then you'd tell me I am lazy and you're utterly right about it. Hopefully I'm going to feel like some *complicated* projects very soon. Stay there for me, please! 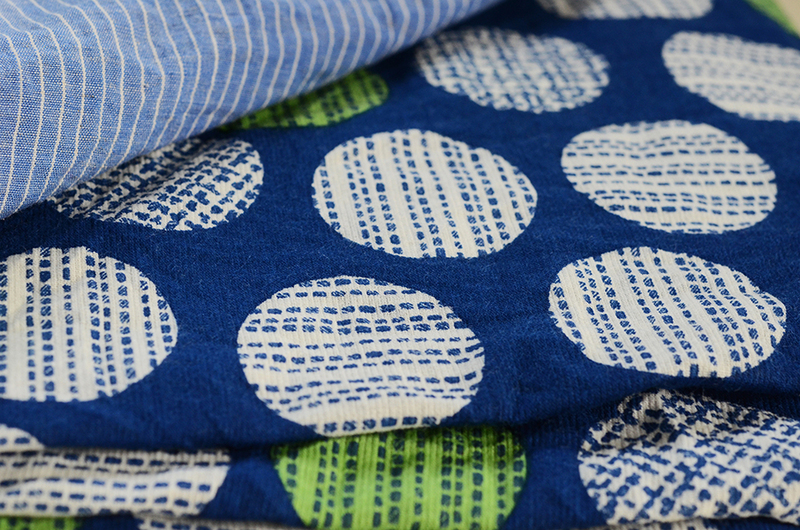 fabric: Linen. Pink, plain, woven, fairly heavy, flow-y, drape-y, and soft. Appeal for asking swap partner was closed. Before saying ta-ta for this silly post, I'd love to ask here if there is anyone who might be interested in making a small swap with me. 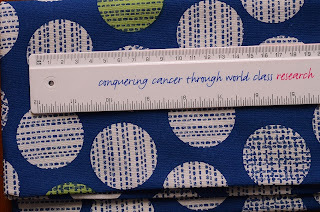 I'd love to offer a tiny piece of polka dot-y fabric to someone who feels fine for sending me the vogue pattern V1247 in return for the fabric. I am certainly able to make an international order for the pattern even if there wasn't anyone to get my idea, so don't worry if you are thinking genuinely helping me out for getting the pattern. The thing is, I encountered this very nice Japanese cotton crepe in this summer. I loved it so much, and then I thought it would be nice if I can share the feel with someone who can imagine any use of it. Happy sewing to you all, friends! Did I say it twice?